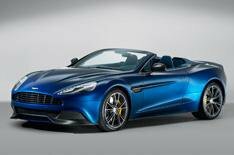 Aston Martin Vanquish Volante revealed | What Car? The 2013 Aston Martin Vanquish Volante is a drop-top version of the company's range-topping sports car. It's also the most structurally rigid convertible in the company's history, and the first with a fully carbonfibre body, according to the manufacturer. It uses the same 565bhp 6.0-litre V12 petrol engine as the standard Vanquish and all that power is sent to the rear wheels via a six-speed automatic gearbox. The Vanquish should do 0-62mph in just 4.1 seconds and carry on to a top speed of 183mph. The soft top on the Vanquish is a triple-skinned fabric unit and takes 14 seconds to fold away. When folded, the roof sits below an aerodynamically tuned cover. In a first for Aston Martin, the windscreen glass goes all the way up to the roof to increase visibility. Aston Martin is also keen to stress the Vanquish Volante's practicality, saying that the new car's boot is 279 litres, 50% larger than that in the previous DBS convertible. The capacity remains the same with the roof up or with it down. The Vanquish is claimed to be 14% stiffer than the DBS Volante, thanks to its new lightweight aluminium underpinnings. It also gets Aston Martin's adaptive damping system, which allows the driver to choose between three settings Normal, Sport and Track. It also comes with carbon-ceramic brakes. The interior is carried over almost unchanged from the Vanquish coupe, albeit with buttons for folding the roof. Order books are open now, with pricing starting at 199,995. First deliveries are expected later this year.